Canada is a beautiful country right above the gigantic United States of America (USA) stands way more than what it is known for. It shared the biggest border in the world with USA. Canada houses some of the major tourist attractions of the world. If you are a nature love desiring to soak in a different culture and visit some of the best known tourist sites in the world then yes, you have chosen country for travel. Canada cannot be singled out for any one category of people; it is enough to entertain all, no matter what. Read on to find the 7 best Places to Visit in Canada. If you are in search of the last real gem of the Pacific Ocean then here is the rainforest that has some beautiful waterways and islands housing sea lions and whales, oldest villages nearing 10,000 years and the famous Kermode bear. This is a suggestion for visit for the adventure seekers looking to play in the lap of nature while playing the rare white spirit bear. To get a whiff of real city life and the urban culture of Canada then do visit the Stanley Park in Vancouver. Witness the people and feel the life with children rollerblading with an ambience of the setting sun along the sea wall. It offers a brilliant view of the mountains, the Prospect Point and the Dead Man’s Island. This is definitely a must visit spot for all those interested in the olden history and monuments around Canada. 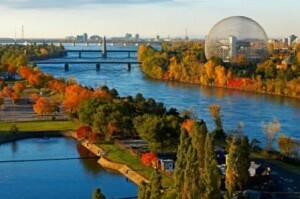 Deemed to be one of the eldest cities in North America, Quebec offers more than what meets the eye. Experience medieval Europe right in the middle of urban Canada with the Château Frontenac, and the snow on the historic Plains of Abraham. If you are an animal freak then here is your chance to see polar bears of the tundra region from buggies that are tractor wheeled. This place is also a great site for bird watchers along with whale watching that happens only in the summers. This is world heritage site, said to be one of the world’s best areas for finding an 80 million year old dinosaur bones. It also houses the Royal Tyrrell Museum, a full dinosaur museum. It is a great sight to visit for museum and animal lovers. Explore this sight to find secret of ancient civilizations on Gwaii Haanas National Park Reserve and Haida Heritage Site on the Queen Charlotte Islands and the largest collection of Haida Totems Poles. These are carved with whales, bears, eagles and other artefacts. It reflects the ancient culture and other old cultural insights of the civilisation. This is a different experience in a developed Canada. These are some of the famous sights that one cannot afford to miss while travelling in Canada.